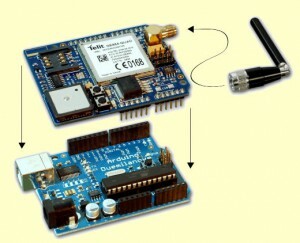 The GSM GPRS GPS-Shield is plugged as ”primary” shield on top of the Arduino board, ensuring that the antenna of the integrated GPS receiver has “free view”. The communication between the two boards is achieved via the serial interface (GSM / GPRS) and SPI (GPS). Any standard screw mount GSM antenna types (stubby, magnetic mount, adhesive mount) with SMA connectors can be used. Demo programs, drivers and libraries for operating theÂ GSM / GPRS / GPS-Shield are of course included. Manufacturing and Product DevelopmentÂ of the Arduino Shield “Made in Germany”, i. e. Unlike many other products in computer equipment, there is a long time availability. Sorry to trouble again, but I would like to know how many pins are free Arduino 2009, after connecting the shield gps / gprs in order to connect a memory card to be used as a logger? I published a table to compare yesterday. The Arduino clone on PIC32MX320F128L has: 2-UART, 2-SPI, 2-I2C. One UART is used for GSM module. The SPI is used for GPS (by SPI to UART converter. The smallest Arduinos has only one UART and one SPI. There is no interface left. On PIC32MX320F128L there is one USB for Android accesory. This you can use for USB memory stick. You can run on PIC32MX320F128L the FreeRTOS and can select from this SW libraries: Android Accessory, IEEE 802.15.4 (ZigBee, MiWi, MiWi P2P), Bluetooth Stack, Ethernet (TCP-IP, Internet), USB â€“ device & host, G.711 Speech Encoding/Decoding, ADPCM and Speex (Audio), Memory Disk Drive File System (FAT 16 and FAT32) to share and transfr data with PCs, Touch Sense (mTouch), Data EEPROM Emulation, Encryption/Decryption, nanoWatt XLP Battery Life Estimator (PIC24F), Graphics (QVGA), Helix MP3 Decoder, Certified Class B Safety, Smart card ISO-7816 and Google PowerMeter. This shield is supporting 5 Volt and 3 Volt Arduinos and all clones. Most Arduino clones are on 3 Volt. So be careful by selecting shields. Yes, as soon I have minute left. BTW, Arduinos are open source. my GSM GPRS GPS Shield that i bought it is different from the picture in up of the page why and it has the same software ? The new version of the shield is able to suppot 5 Volt Arduino and 3 Volt Arduino clones. The new shield is using later GSM modules and GPS modules as well. My skills are in hardware. With software I have no experience. What about to ask the manufacturer of the shield? I have this shield but when I try to initiate the communication, the arduino print AT+CREG?. Ammeenoz, you will get an email from me. AT+CREG tells you the status of the registration. What type of GSM module is mounted on yor shield? Is it possible to control the gsm signal the arduino uno analog outputs? Vili, I do not understand your question. Please explain more. Hie Vili can i get the source for the one you mentioned about controlling the arduino pins. Sorry, but I am in hardware only. Sorry, but I am in hardware mainly.